Sybarite5, returning to Penn State after its remarkable State College debut in 2016, is always on the lookout for new tunes and composers speaking with unique and relevant voices. Outliers, the title of the string quintet’s concert program and its 2018 album, celebrates works written for the ensemble by the musicians’ favorite composers and friends they’ve made while traveling the world. Sybarite5, the first string quintet to win the Concert Artists Guild International Competition, performs the music of Andy Akiho, William Brittelle of Future Shock, Kenji Bunch, Shawn Conley, Michael Gilbertson, Jessica Meyer, Marc Mellits, Brandon Ridenour, Steven Snowden, Dan Visconti, and Aleksandra Vrebalov. The “Millennial Kronos,” as the ensemble has been nicknamed, pairs those selections with Armenian folk music plus songs by Astor Piazzolla and Radiohead. 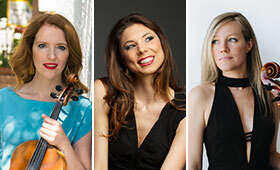 Formed at the Aspen Music Festival, the New York City-based quintet features violinists Sami Merdinian and Sarah Whitney, violist Angela Pickett, cellist Laura Metcalf, and bassist Louis Levitt. The program selections will be announced from the stage. Artistic Viewpoints will not be offered before this performance. Classical Coffeehouse is free for University Park students. A $10 donation is suggested for each community member. Donations help to sustain the coffeehouse series. Due to inclement conditions, and University closure, the Classical Coffeehouse has been cancelled. Presented by the Center for the Performing Arts at Penn State and the Penn State Alumni Association in partnership with the Blue & White Society, the PSU Music Service Club, and the Penn State Coffee Club. Watch Sybarite5 cover “Take on Me” by A-ha.